January 9, 2013, 12:21 PM · Maxim Vengerov couldn't be happier to be playing the violin again, after his four-year hiatus from performing, and after the painstaking reinvention of his playing technique following shoulder surgery. January 9, 2013 at 09:58 PM · Laurie, thank you for the great questions, and Maxim Vengerov thankyou for the generosity in answering and giving so much. Maxim's early recording of Tchaikovsky was what started me off learning. I'm glad to hear he's playing and conducting and looking forward to long careers in both. January 10, 2013 at 12:26 AM · Thanks for a great interview! I had the pleasure of seeing Maxim perform when I was studying at McGill University. It was a fabulous performance! January 10, 2013 at 04:34 AM · Excellent questions - many thanks. Maxim said his teaching style has changed due to several factors, among them "experiences with viola". Does anyone know anything about his viola experience? Thank you. That is, Vengerov playing the Walton Concerto, which he recorded in 2003 with Rostropovich and for which he won a 2004 Grammy. Pretty spiffy! 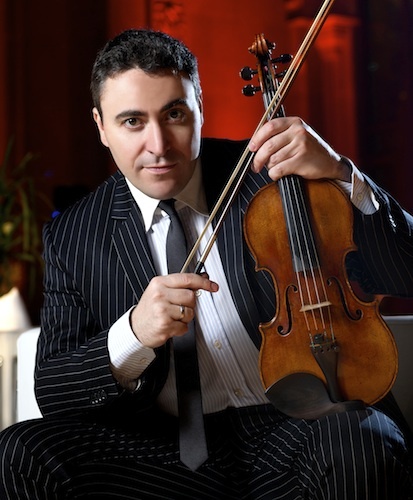 January 10, 2013 at 10:36 AM · Maxim Vengerov is cool! But why conducting?! Ok, I can see why. Maybe because it was the only thing he could do after the injury. But I once saw him conducting and was surprised... He is such a good violinist, why did he conduct like that. I am totally interested in a book of him describing his way back to the violin in detail. What kind of shoulder injury he got, what was the potential cause and how long did he continued playing in pain before it was too late. I like that he stated that pain was his teacher somehow. I had some issues with my hand last summer and after 1 and a half month break I was again able to play but had to start very carefully and in small amounts building it up slowly. And like Vengerov said, Pain changed my technique to the better and more efficient and free. Its so important to be efficiant in movement. I think that Vengerov could play with much movement some years because he had a quite healthy and good body overall. But after all, even he wasn't immune to inefficient technique. I like his honesty. I wonder why it came so late, that he spoke about the real reasons for his break. January 10, 2013 at 03:06 PM · Simon, you ask "why conducting" -- I think there are several reasons: his mentors were (are, in the case of Barenboim) both conductors, his mother conducted, and also, it was a way to get a broader and different view on music. To study it intensively was to find a different kind of inspiration and a new way to interact with other musicians, that is what I see. , which cost him several years. I am also waiting for a detailed book of Maxim about his injury. January 11, 2013 at 01:43 AM · Barenboim is at first hand an outstanding Pianist, some great conductor once stated he should have stayed with playing piano and leave the conducting. I also heard from people that he doesn't like to rehearse and never rehearses with his famous project with israelian and palestinean musicians. Also I heard him with his (!) orchestra once live. Nothing special! So Vengerov goes the same way as his mentor, but I think he should not do the same fault. But still both play their instruments wich is good. But for cunducting... I don't like either of them. January 11, 2013 at 11:44 AM · It was actually really inspiring, Thanks Laurie, Maxim is my favorite artist! January 11, 2013 at 11:25 AM · What a brilliant interview! These are excellent questions. It sounds like Maxim has always intended to conduct, Simon, what with his mentors, his relationship with his conductors, his mother, his past oft-spoken desire to get a broader view on music and as with those who have reached an initial goal, there's the pursuit to learn something new to re-invent oneself as a hopefully, better person with a more mature or collaborative outlook and a more meaningful or fulfilling life, not just as a soloist. Maxim likes to talk about Slava's humanity. I remember when I reached my childhood ambition, like others, I'd stared at my desk not a few times when a chord struck: Is that it? When my dad suddenly died early of heart failure and also on reaching late motherhood & having to care for special needs kids who almost bankrupted me, a whole new perspective opened up & gripped me with passion anew. Adversities can bring the better out of us. So it sounds to me from the interview above, like, his adverse health condition did not force Maxim to resort to conducting although this injury may well have a clear effect on the TIMING of his change in direction. Given time, he can be judged fairly as it's early days yet and far too soon to say now how he is as a conductor although I would agree [after seeing him in action, rehearsing] that Barenboim is greater as a pianist. I am impressed by Maxim's so-earnest view on competitions albeit remaining unconvinced that they are "necessary" as he put it for that rare personal interpretation and for inspiration? However, being a huge fan of Gil Shaham, I'm naturally biased. Still, it's a performance that inspires not the competition [shell facility] and the former does not "need" the latter. Maxim inspires us [whether or not he is also a competition winner]. January 11, 2013 at 02:55 PM · Simon, why does a musician want to conduct? Once you think of an orchestra as a huge musical instrument, think of it as some kind of organ, it makes a lot of sense. The conductor is effectively playing the orchestra and interprets an orchestral piece of music, much like the solo violinist is playing his violin and interprets a piece for solo violin, say. Needless to say you have to be a musician of the highest caliber to be able to be worthy conductor. January 12, 2013 at 06:42 AM · I agree--a brilliant interview. I especially liked what Vengerov said about finding players with the most highly developed souls, because technique is at such a high level for so many players. P.S. When I saw him play, in the early 80's, he must have been just starting out because it was so easy to get tickets for a small venue. It's great to see what he has become. January 13, 2013 at 01:21 AM · Wonderful interview, really enjoyed reading it. Maxim is one of my very favourite contemporary violinists and it is great to see him back on the violin. I'm not so sure he has as much to say musically as a conductor, but can understand how conducting would give him an additional perspective to his violin playing. This is such a wonderful and informative interview — I thoroughly enjoyed reading it. January 15, 2013 at 12:03 PM · I concur that this is a marvellous interview, well done on asking such pertinant questions and a big thanks to Maxim for such open and honest replies. I wonder whether the technical progress and the advancement of technique demand greater development of the soul, or whether the progression of the soul of individuals and humanity drives the development of technology and technique so that it can be expressed. I too would love to see a book on how Maxim re-invented his technique, how likely it is I don't know. Let's hope! January 16, 2013 at 03:14 PM · "Simon, why does a musician want to conduct? Once you think of an orchestra as a huge musical instrument, think of it as some kind of organ, it makes a lot of sense. The conductor is effectively playing the orchestra and interprets an orchestral piece of music, much like the solo violinist is playing his violin and interprets a piece for solo violin, say. Needless to say you have to be a musician of the highest caliber to be able to be worthy conductor. " I know what you mean, but I see it very different. Out of experience and cionviction. The Logic shows me: An good Conductor can only work with an good orchestra. An good orchestra don't need an conductor to play great. Most bad concerts are caused because of the conductor. Very good orchestras play bad because, they don't like the conductors ideas, personality or conducting. They then don't play their way, but they sabotage. I heard this often and its a shame to the music. So, if you are a good conductor (wich I would consider not much more than 5 in this world: Abbado I like, Metha is outstanding in accompaniment, and some more, wich I don't know by name) you also have to be respected by the orchestra, wich is a question of the orchestras taste. Of cause being an outstanding instrumentalist helps in this case a lot. There are many ways to grow as a person and I think very highly of vengerov, because he teaches. But to conduct I think is not necessarily what the music world needs. Conducting is a full time job and even at full time, most fail to accomplish what is needed. I think he should build up an small ensemble out of followers and grow with them. Like the Kremerata Baltica for example.